Low health literacy (HL) is associated with poor health status and outcomes. Racial/ethnic minorities in the United States disproportionately experience low HL and HL-related health disparities. Among Latinos, acculturation is associated with health outcomes, but little is known about the relationship between acculturation and HL. We examined associations of sociodemographic and acculturation variables with English- and Spanish-language HL among 142 bilingual Latino adults with adequate HL. HL was assessed in English using the Rapid Estimate of Adult Literacy in Medicine (REALM) and in Spanish with the Short Assessment of Health Literacy for Spanish-speaking Adults (SAHLSA). Acculturation was assessed using the four subscales of the Multidimensional Acculturation Scale-II. Associations of sociodemographic data and acculturation with HL were examined using linear regression. Higher education, higher income, higher English proficiency, and lower Latino cultural identification predicted REALM scores (ps <.05) in univariate models. When these variables were entered into a single model, only education and Latino cultural identification were associated with REALM scores. In univariate analyses, the following characteristics were associated with SAHLSA scores: female gender, being partnered, higher education, higher income, being non-US born, lower English proficiency, and higher Spanish proficiency (ps < .05). Education, being non-US born, English proficiency, and Spanish proficiency were each significant in the multivariate model. The results of this investigation revealed a significant association between acculturation and English- and Spanish-language health literacy among bilingual Latino adults. This suggests that health literacy should be assessed in the language in which individuals are most proficient. Health literacy assessed in a nonprimary language may be influenced by language proficiency. Health literacy (HL) is the “degree to which individuals have the capacity to obtain, process, and understand basic health information and services needed to make appropriate health decisions” (U. S. Department of Health and Human Services [USDHHS], 2000). Although HL is associated with general literacy, it is also influenced by culture, prior learning, and situational and system demands (USDHHS, 2000). Further, it includes a number of skills (e.g., information-seeking, decision-making, communication skills, numeracy) that are essential for navigating health services and maintaining good health (Duell, Wright, Renzaho, & Bhattacharya, 2015; Nutbeam, 2008). The National Assessment of Adult Literacy revealed that roughly one-half of adults in the United States have HL difficulties (Kutner, Greenberg, Jin, & Paulsen, 2006). Low HL is associated with numerous indicators of poor health and adverse health outcomes, including higher rates of premature mortality (Berkman, Sheridan, Donahue, Halpern, & Crotty, 2011). Moreover, it has been identified as “a stronger predictor of a person's health than age, income, employment status, education level, and race” (American Medical Association, 1999), and is a significant contributor to health disparities (Lindau et al., 2002; Sentell & Halpin, 2006; Williams, Baker, Parker, & Nurss, 1998). Those with lower socioeconomic status (SES; as indicated by education, income, and employment status) and racial/ethnic minorities are disproportionately affected by low HL (Kutner, Greenberg, & Baer, 2005). For instance, Latinos are more likely than non-Latino Whites to have low SES (Barnett & Vornovitsky, 2016; Proctor, Semega, & Kollar, 2016). Although HL among Latinos has been associated with access to health care, social networks, capital, health-related skills (e.g., medication dosing), sociolinguistic environment, and comfort with speaking English (Ciampa et al., 2013; Jacobson, Hund, & Soto Mas, 2016; Leyva, Sharif, & Ozuah, 2005; López et al., 2016), very little is known about which sociodemographic variables may be associated with HL other than SES (Becerra, Arias, & Becerra, 2017; Ross & Wu, 1995; Sentell & Halpin, 2006). In addition to SES, acculturation is an important factor that might be uniquely associated with HL among Latino adults. Acculturation is a multidimensional process whereby individuals of a cultural group (e.g., Latinos) selectively adopt behaviors, practices, values, and self-identifications of a receiving or dominant culture (e.g., American) while selectively maintaining the behaviors, practices, values, and self-identifications associated with their heritage culture (Schwartz, Unger, Zamboanga, & Szapocznik, 2010). Acculturation is correlated with numerous health behaviors, and the associations are complex (for a review, see Lara, Gamboa, Kahramanian, Morales, & Bautista, 2005). For example, greater acculturation toward American culture is generally associated with higher likelihood of engaging in unhealthy behaviors (e.g., unhealthful eating, substance use). However, higher American acculturation is positively associated with improved SES, use of preventive services, and health insurance enrollment (Lara et al., 2005). Few studies have examined the complex relationships between HL, acculturation, and health behaviors among diverse racial/ethnic groups (e.g., Asian American, African American) in the U.S. (Choi, Rush, & Henry, 2013; Geltman et al., 2013; Li, Matthews, & Dong, 2018). These investigations suggest that often those with higher HL and U.S. acculturation have healthier behaviors; however, findings were limited, and HL and acculturation were operationalized and measured using various methods. Only two known published studies have examined the relationship between HL and acculturation among Latino adults. In the first study, Ciampa et al. (2013) found that higher U. S. acculturation scores (assessed with the Short Acculturation Scale for Hispanics [SASH]; Marin, Sabogal, Marin, Otero-Sabogal, & Perez-Stable, 1987), were positively associated with Spanish-language HL. In the second study, López et al. (2016) used the Bidimensional Acculturation Scale (BAS) (Marin & Gamba, 1996) to categorize people into high and low U. S. acculturation levels and found that persons in the high-acculturation group were significantly more likely to have adequate Spanish or English HL compared to persons in the low-acculturation group. Although findings suggest that greater acculturation toward American culture is associated with higher HL in either English or Spanish, both studies are limited in their unidimensional operationalization of acculturation. These measures are considered unidimensional in that they evaluate acculturation following the premise that increased involvement in American culture is indicative of decreased involvement in Latino culture (Rodriguez, Mira, Paez, & Myers, 2007). Use of the BAS (López et al., 2016) further limits examination of acculturation to the language domain, and although the SASH consists of three domain factors (language use, media, social relations), Ciampa et al. (2013) used the mean of all items and thus did not allow for explicit examination of acculturation in distinct social or inter-/intrapersonal domains. As such, it is unknown if acculturation in different domains or acculturation toward one's heritage culture are associated with HL among Latinos. Research is needed to understand how acculturation might be associated with HL in Latino adults. Furthermore, due to the common association of acculturation and HL among Latinos in prior studies, investigations should attempt to understand the unique associations of SES and acculturation with HL. The purpose of the current study was to examine the associations of sociodemographic data and multiple domains of acculturation with English- and Spanish-language HL in a sample of bilingual Latino adults. The current study builds upon extant work by examining acculturation independently in multiple domains, and in both directions toward American culture and Latino culture. The current study was an exploratory examination of associations between acculturation (measured multidimensionally) and HL; therefore, we refrain from making hypotheses about the relationships in question. The findings have the potential to provide a more nuanced understanding of the relationship between acculturation and HL, which has implications for the assessment of HL, as well as for targeting and developing HL programming and interventions to improve HL among vulnerable populations. Participants were 142 self-reported bilingual Latino residents of the Houston, Texas, metropolitan area who were part of a study examining psychosocial and contextual influences on multiple health risk behaviors among Latinos (for detailed procedures, see Reid et al., 2018). Smokers were oversampled; thus, approximately one-half of the participants were smokers. Inclusion criteria were (1) self-identification as Latino; (2) age 18 to 65 years; (3) having a valid home address and a functioning telephone number, and; (4) self-report of being bilingual in English and Spanish, and demonstrating marginal to adequate HL in English via a score of >45 on the Rapid Estimate of Adult Literacy in Medicine (REALM) (Davis et al., 1993) and in Spanish via a score of >38 on the Short Assessment of Health Literacy for Spanish-speaking Adults (SAHLSA) (Lee et al., 2010). Adequate HL was an inclusion criterion for the larger study (Reid et al., 2018). Exclusion criteria were (1) use of an illicit substance in the past 30 days; (2) another household member enrolled in the study; (3) currently pregnant or breast-feeding; (4) participation in a smoking-cessation program in the last 90 days; (5) current use of nicotine-replacement products; or (6) use of tobacco products other than cigarettes. Participants were recruited via local newspaper and radio advertisements and in-person outreach. Participants were screened for all eligibility criteria except HL via telephone. English-language HL and Spanish-language HL were assessed during the in-person assessment to determine final eligibility. Participants completed a series of questionnaires assessing numerous sociodemographic, sociocultural, psychological, and behavioral health factors and were compensated for their time and effort. All study procedures were completed in English. The research protocol was approved by the Institutional Review Board of The University of Texas MD Anderson Cancer Center. Participants responded to questions assessing self-reported age, gender (male = 1; female = 0), partner status (with a spouse/partner = 1; without a spouse/partner = 0), employment status (employed full or part time = 1; not employed = 0), and years of education completed. Annual household income was measured on an ordinal scale (1–11) representing 11 income ranges (“1” = $0–$2,400; “11” = $84,000 or more). Nativity status is a demonstrated proxy of acculturation and was measured by self-report of being born in the U.S. (U.S. born = 1; not U.S. born = 0). Acculturation domains were assessed with the Multidimensional Acculturation Scale-II (MAS-II; Rodriguez et al., 2007). The MAS-II is a 22-item self-report measure with four subscales: English proficiency, Spanish proficiency, American cultural identification, and Latino cultural identification. Language-proficiency items assess ability and pleasure taken in use of the respective language. Possible mean scores range from 1 to 5.16 for English proficiency and 1 to 5.2 for Spanish proficiency. Cultural identification items assess cultural identification and pride, importance of cultural values, and pleasure taken in cultural practices. Possible mean scores on the cultural identification scales range from 1 to 5. Higher mean scores indicate greater acculturation on the respective factor. English- and Spanish-language HL were measured with the REALM and SAHLSA, respectively. The REALM (Davis et al., 1991) is a word recognition test that assesses a person's ability to read and correctly pronounce 66 common health-related words (e.g., flu, germs) and lay terms for body parts (e.g., eye, kidney). Participants are instructed to read through the list of words and to correctly pronounce as many words as possible. Scoring is based on standard dictionary pronunciation rules, and participants receive 1 point for each word pronounced correctly. Scores range from 0 to 66, and scores of <45 (below an 8th grade literacy level) indicate inadequate HL. The SAHLSA (Lee, Bender, Ruiz, & Cho, 2006) is a rapid screening test that was developed based on the REALM. It consists of a reading list of 50 common medical words in Spanish (e.g., obesidad) and two association words (e.g., peso, altura). Scoring is based on the correct pronunciation and accurate association of stem words with association words. Scores range from 0 to 50, and scores of <37 indicate inadequate HL. Analyses were conducted using the Mplus Version 8 software package (Muthén and Muthén, 2017). Data were examined for normality and collinearity. Distributions were examined by visual inspection of scatterplots and histograms, and with skewness and kurtosis statistics utilizing critical values of 2 and 4, respectively (Kim, 2013). Multicollinearity was examined using bivariate correlations >.90 and against values of <.10 for tolerance and >10 for variance inflation factor (VIF) (O'Brien, 2007). Sample descriptive statistics, bivariate correlations, and proportion of missing data were computed for each variable. Maximum likelihood estimation was utilized to generate 20 imputed datasets (Graham, Olchowski, & Gilreath, 2007), and data were imputed for all variables with any missing data. All variables use in the current analyses were included in the imputation model. Missing data involving the MAS-II were imputed at the item level, and composite scores were calculated using the imputed data (Enders, 2010). Consistent with preliminary diagnostics, the first data set was saved after 11,000 iterations of the imputation algorithm, and subsequent saved datasets were separated by 11,000 iterations. Parameter estimates were pooled across the 20 imputed datasets according to Rubin's rules (Rubin, 2004). Linear regression models were estimated using maximum likelihood and robust standard errors with each of the two outcome variables of interest (i.e., REALM and SAHLSA scores). First, univariate linear regressions were conducted in which the outcome was regressed onto each sociodemographic variable and MAS-II subscale. To determine which sociodemographic and acculturation variables had unique relations to the outcome, those that demonstrated significant associations with the outcome variable in univariate analyses were simultaneously regressed onto the outcome variable in a multivariate model. Due to the exploratory nature of the study, criteria for determining statistical significance was p < .05 without correction for multiple comparisons. Data diagnostics. All of the continuous variables of interest exhibited acceptable skew and kurtosis except for the REALM, which exhibited negative skew. Correlations, tolerance, and VIF were in the acceptable range for all variables. There were no missing data for age, gender, employment status, or years of education. Missing data for the remaining variables ranged from 0.7% (REALM and SAHLSA) to 15% (income). Participant characteristics and bivariate correlations. 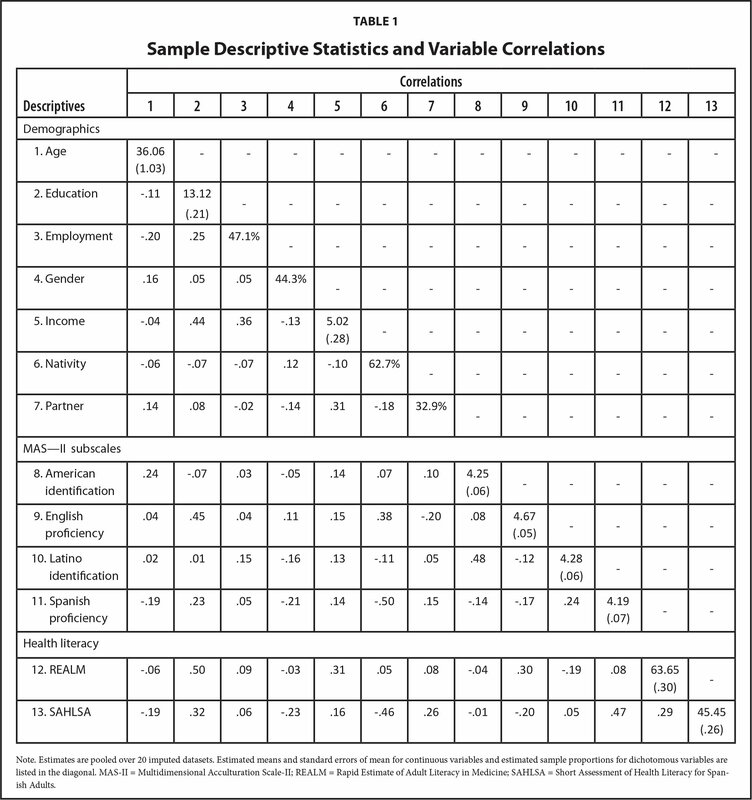 Sample descriptive statistics are summarized in Table 1. Just more than one-half of participants were female (55.7%) and unemployed (52.9%). Approximately two-thirds were non-partnered (67.1%) and born in the U. S. (62.7%). On average, participants were age 36 years and had completed approximately 13 years of schooling. Most reported an annual total household income ranging from $24,000 to $30,000. The mean MAS-II English proficiency score was significantly higher than the mean Spanish proficiency score (4.67 vs. 4.19, p < .001). Mean Latino cultural identification and American cultural identification scores were not significantly different (4.28 vs. 4.25, p = .62). The mean REALM score was 63.65 and the mean SAHLSA score was 45.45, suggesting that participants had adequate HL on average. Bivariate correlations among variables are also summarized in Table 1. These correlations reveal associations of education with income (r = .44), English proficiency (r = .45), and REALM scores (r = .50). Correlations also showed associations of nativity (U.S. born) with SAHLSA scores (r = −.46) and Latino identification (r = −.46). REALM. Univariate analyses revealed that higher REALM scores were significantly associated with more years of education, higher income, lower Latino cultural identification, and higher English proficiency. 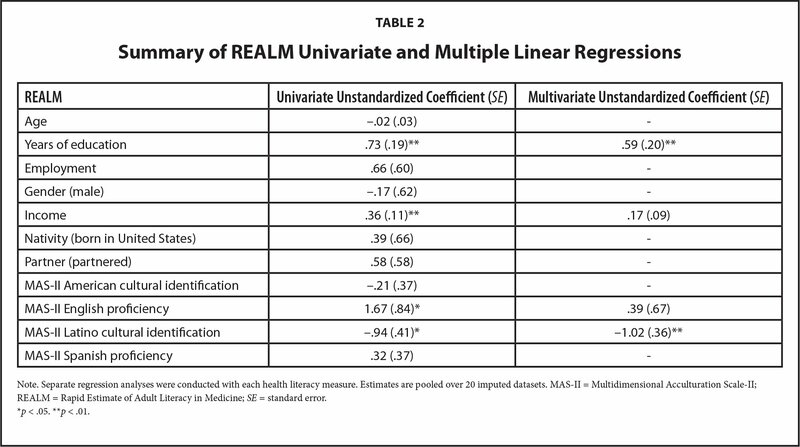 When these four variables were entered into a regression model simultaneously, only education and Latino cultural identification were significantly associated with REALM scores (Table 2). SAHLSA. Univariate results indicated that higher SAHLSA scores were significantly associated with being female, being partnered, more years of education, higher income, being non-U. S. born, lower MAS-II English proficiency, and higher Spanish proficiency. 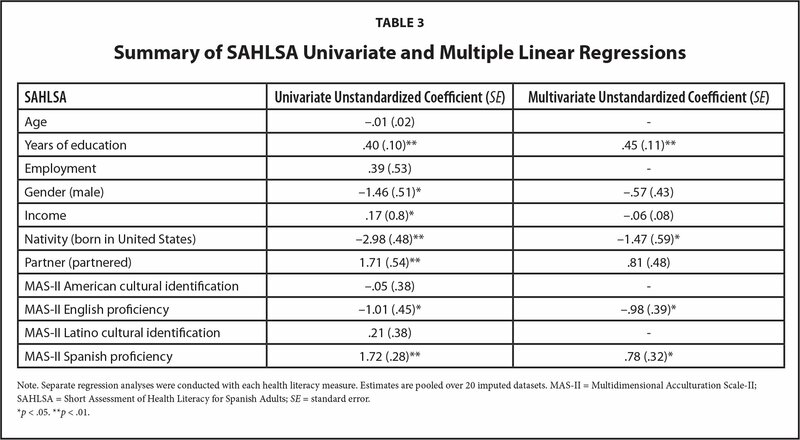 When these seven variables were entered into a regression model simultaneously, four remained significantly associated with SAHLSA scores: education, nativity, English proficiency, and Spanish proficiency (Table 3). The current study was an exploratory examination of socio-demographic and acculturation-related predictors of HL among bilingual Latino adults with adequate HL. Four of the predictors examined here were associated with English language HL in univariate models (years of education, income, Latino cultural identification, and English proficiency). But in a multivariate model that included all of these variables, only education and Latino cultural identification predicted English HL. In contrast, seven variables were associated with Spanish-language HL (gender, partner status, education, income, nativity, English proficiency, and Spanish proficiency), and four remained significant predictors in a multivariate model (education, nativity, English proficiency, and Spanish proficiency). Consistent with previous work, higher education was associated with both higher English- and Spanish-language HL in the current study. Although income was associated with English- and Spanish-language HL in univariate models, these relationships were no longer significant in the multivariate models. Bivariate correlations indicated a moderate-to-strong association of education with income. Thus, education likely accounts for the relationships of income with English and Spanish HL observed in univariate models. Bivariate correlations indicate that income and partner status were moderately associated; thus, it appears neither had a unique association with HL when the other was accounted for. Gender demonstrated small associations with all other variables in the multivariate model; hence, higher mean SALHSA scores demonstrated by women may have been a function of gender differences in numerous demographic and acculturative variables. Thus, of the demographic variables examined in this investigation, education appears to be uniquely important to the assessment of HL in English and Spanish. Prior research has found that HL and educational attainment have similar roles in determining differences in health status (Howard, Sentell, & Gazmararian, 2006). Nevertheless, studies have cautioned against using educational attainment as a proxy for HL because HL is a multidimensional construct influenced by a number of complex factors (e.g., culture, prior learning, situational and system demands, information-seeking, decision-making, communication skills, numeracy; Duell et al., 2015; Nutbeam, 2008; USDHHS, 2000). Consistent with this notion, we found that a number of culturally relevant variables were uniquely associated with HL. Being foreign-born and more proficient in Spanish were uniquely associated with greater Spanish-language HL. This may speak to the influence of one's history of exposure to and proficiency in the language of assessment on one's performance on HL measures. Higher English proficiency was uniquely associated with worse performance on the SAHLSA. In a sample that, on average, was significantly more proficient in English than Spanish, there could have been cognitive or situational factors associated with higher English proficiency that negatively affected performance on a Spanish-language HL test (e.g., discomfort about not being able to speak the language in which one is more proficient during a test situation; concern about lower performance in Spanish relative to English; generally lower self-efficacy for speaking Spanish versus English). Furthermore, such concerns may exist independently of one's actual Spanish proficiency. Taken together, findings regarding language proficiency suggest that performance on HL measures could be reflecting language proficiency (or language-related concerns) when an HL assessment is not conducted in the person's primary language. This underscores the importance of assessing HL in one's primary language regardless of level of education or proficiency in the second language. Moreover, it underscores the need to ensure that resources intended to facilitate the making of health-related decisions, such as health education materials and patient navigation services, be available in the primary language of the patient. Higher Latino cultural identification was associated with lower English-language HL. Other work has found that acculturation, or its proxies, is associated with a number of health service/use behaviors that may in turn influence HL. Persons with greater acculturation toward their heritage culture (typically as measured by unidirectional measures/proxies) report more barriers to care and are less likely to seek out patient services for physical or mental health, use preventive services, attend postpartum appointments, or have a regular service provider (Ciampa et al., 2013; Lara et al., 2005; López et al., 2016; Sentell, Shumway, & Snowden, 2007). Thus, higher Latino cultural identity may be associated with lower HL by way of its association with health service use behaviors that provide opportunities for exposure to important health information and opportunities to make health-related decisions. Providing culturally sensitive HL-related educational opportunities or community discussions may provide the cultural identity supports that extend beyond language. Participants were Latinos who were bilingual in English and Spanish. Thus, results may not be generalizable to Latinos who speak only one language. The sample was also relatively highly acculturated toward both American and Latino heritage culture. Findings may differ in samples with different patterns of acculturation. In this sample of those with adequate HL, scores on the REALM were skewed toward the high end; however, we used robust standard errors to help address this challenge. The current analyses were exploratory; therefore, additional research is needed to corroborate current findings. Finally, because HL was an inclusion criterion for the larger study that focused on smoking, participants with the lowest levels of HL were excluded and smokers were oversampled. Future research examining those with a wider range of HL may provide additional insights. Eliciting bilingual Latino adults' language preferences is a critical step in supporting HL. Acculturation appears to play a role in the HL skills needed for bilingual Latino adults with adequate HL to navigate health systems. To support HL needs for this population, efforts are needed to identify factors driving language preferences and to develop culturally and linguistically relevant materials. Investigating the role of acculturation has the potential to inform the development of interventions to support HL in this growing U.S. population. American Medical Association. (1999). Health literacy: Report of the Council on Scientific Affairs. Ad Hoc Committee on Health Literacy for the Council on Scientific Affairs. Journal of the American Medical Association, 10(281), 552–557. Davis, T. C., Long, S. W., Jackson, R. H., Mayeaux, E., George, R. B., Murphy, P. W. & Crouch, M. A. (1993). Rapid estimate of adult literacy in medicine: A shortened screening instrument. Family Medicine, 25(6), 391–395. Kutner, M., Greenberg, E., Jin, Y. & Paulsen, C. (2006). The health literacy of America's adults: Results from the 2003 National Assessment of Adult Literacy. (NCES 2006–483). Retrieved from National Center for Education Statistics website: https://nces.ed.gov/pubs2006/2006483.pdf. Muthén, L. K. & Muthén, B. O. (2017). Mplus user's guide (8th ed.). Los Angeles, CA: Muthén & Muthén. Proctor, B. D., Semega, J. L. & Kollar, M. A. (2016). Income and poverty in the United States: 2015. Retrieved from U. S. Census Bureau website: https://www.census.gov/library/publications/2016/demo/p60-256.html. Rubin, D. B. (2004). Multiple imputation for nonresponse in surveys. Hoboken, NJ: Wiley-Interscience. Ashley J. Housten, OTD, is an Instructor, Department of Health Services Research, The University of Texas MD Anderson Cancer Center. Diana Stewart Hoover, PhD, is an Assistant Professor, Department of Health Disparities Research, The University of Texas MD Anderson Cancer Center. Virmarie Correa-Fernández, PhD, is an Assistant Professor, Department of Psychological, Health, and Learning Sciences, The University of Houston. Larkin L. Strong, PhD, is an Assistant Professor, Department of Health Disparities Research, The University of Texas MD Anderson Cancer Center. Whitney L. Heppner, PhD is an Associate Professor, Department of Psychological Science, Georgia College & State University. Christine Vinci, PhD, is an Assistant Member, Department of Health Outcomes and Behavior, Moffitt Cancer Center. David W. Wetter, PhD, is a Professor, Department of Population Health Sciences and The Huntsman Cancer Institute. Claire A. Spears, PhD, is an Assistant Professor, Division of Health Promotion and Behavior, School of Public Health, Georgia State University. Yessenia Castro, PhD, is an Associate Professor, Steve Hicks School of Social Work, The University of Texas, Austin. Address correspondence to Ashley J. Housten, OTD, Department of Health Services Research, Division of Cancer Prevention & Population Sciences, The University of Texas MD Anderson Cancer Center, 1515 Holcombe Boulevard, Unit 1444, Houston, TX 77030; email: ajhousten@mdanderson.org. Grants: This research was supported by a grant (P30 CA016672) from the National Cancer Institute at the National Institutes of Health (NIH) to The University of Texas MD Anderson Cancer Center as a Cancer Center Support Grant. A. J. H. reports a grant (R25T CA57730) from the NIH. Y. C. reports grants (K01 CA157689 and R25T CA57730) from the NIH and a grant (R21 MD011431) from National Institute on Minority Health and Health Disparities (NIMHHD) of the NIH. A. J. H. reports a grant (K99 MD011485) from the NIMHHD of the NIH. C. V. reports a grant (R00 MD010468) from the NIMHHD of the NIH. D. S. H. reports a grant (K23 DA040933) from the National Institute on Drug Abuse at the NIH. V. C.-F. reports a grant (R25T CA57730) from the NIH and a grant (MRSG-15-018-01-CPPB) from the American Cancer Society. L. L. S. reports a grant (MRSG-13-145-01) from the American Cancer Society. C.A.S. reports a grant (K23 K23AT008442) from the National Center for Complementary and Integrative Health. .
Disclaimer: The content of this article is solely the responsibility of the authors and does not necessarily represent the official views of the sponsoring organizations. © 2019 Housten, Hoover, Correa-Fernández, et al.